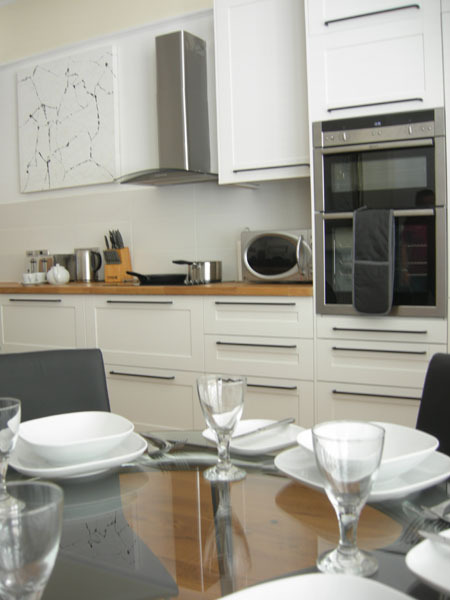 High Street Suite 3 is a one bedroom self-catering holiday home equipped to 5 star standard and located in the heart of Ventnor’s thriving High Street. 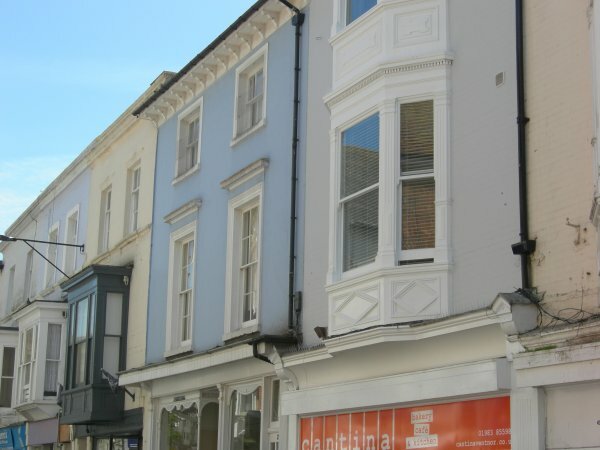 It is handy for local individual shops including designer boutiques, genuine made to measure boot and shoe makers and high quality places to eat and drink. It has been sympathetically created from the first floor of a Victorian building dating from 1890. Unusually for the High Street it has its own dedicated car parking space. It is a short walk to the beach on the south coast of the Isle of Wight. 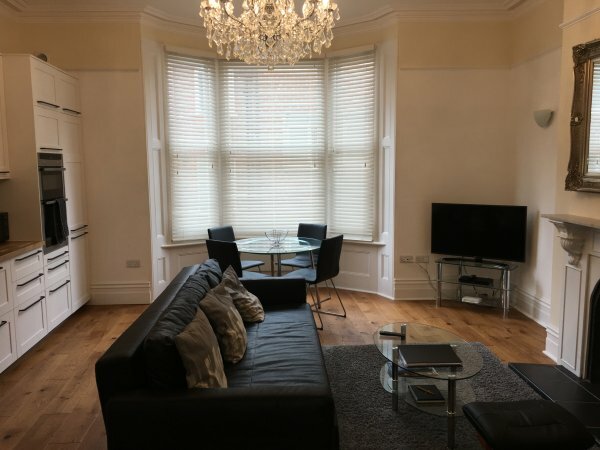 The apartment has a spacious living, dining and kitchen area overlooking the High Street through a large bay window. Dine in the bay watching the world go by and as you look back into the impressive sized high ceilinged room you can admire the large crystal chandelier and marble topped fireplace. There is also a nicely sized shower room and double bedroom with a large south facing window. The nearest restaurant, Cantina (recently listed as one of the top ten places in the UK to have breakfast by the Guardian), is straight outside the front door. Within ten minutes walk there are numerous pubs, cafés, bars and restaurants. These include the Royal Hotel, which has two AA Rosettes for its food, The Rex serving Italian food overlooking the bay, and on the seafront the Michelin listed Ale and Oyster and the Spyglass Inn known for its fine ales, and waterfront location. Within a hundred yards or so are a Coop, Tesco Express, newsagent, Post Office, traditional butcher and delicatessen, fruit and veg shop selling Island produce, antique shops and a shop dedicated to selling homemade ice-cream. Spectacular coastal walks can also be enjoyed from here, to Bonchurch, the Undercliff and Shanklin in the east and to the lovely Steephill Cove and the renowned Ventnor Botanic Garden to the west. Outdoor pursuits include walking, cycling, riding, golf and water sports. There is also a well maintained beach where you laze the day away. Ventnor is a charming Victorian coastal town built on the sheltered Undercliff on the Isle of Wight’s south coast and dominated by the island’s highest point, St Boniface Down. Known to the Victorians as “England’s Madeira”, the town is noted for its sunny summers and mild winters. We loved the chandeliers in both rooms and the comfortable living space ... Everything was a very high standard. We had a wonderful stay. Very impressed with the flat and location. Great information pack. Everything you need - will come again! 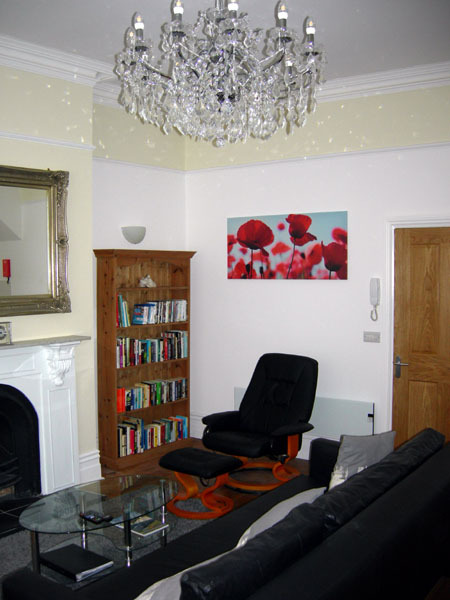 Apartment well equipped, bright and airy, spacious and beautifully clean. Bed comfiest slept on.